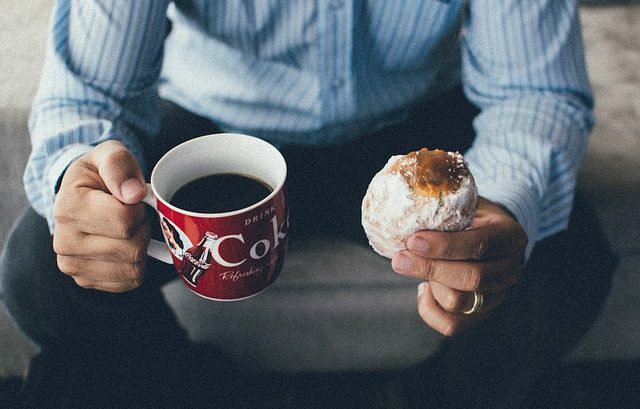 Ivan Misner shares how diet and eating habits can boost your employees’ productivity. 3) Serve healthy alternatives at luncheons and office celebrations. At a recent TLC conference in Mexico, I had the opportunity to talk to my good friend Eric Edmeades, one of the world’s leading experts in entrepreneurship, about his take on the one thing entrepreneurs need to nurture in order to achieve phenomenal success and to be able to actually enjoy their retirement once they enter into it. What is that one thing? . . . Watch the video to find out. I will tell you that if you don’t have it, your brain will not be capable of functioning at full capacity and it will be very difficult to achieve lasting success. Also, you won’t be fully able to enjoy the retirement you worked so hard for when that stage of your life finally arrives. Once you’ve watched the video, I highly encourage you to help out the community of blog readers on BusinessNetworking.com by sharing one of the most effective things you do to nurture the area of your life that is so crucial to succeeding and thriving throughout your career and ultimately making the most of your retirement years. 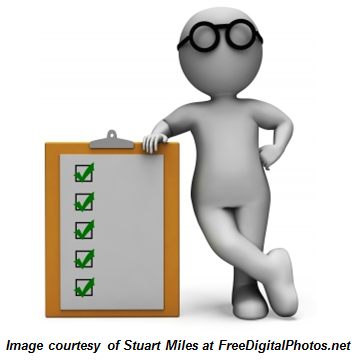 Please share your thoughts and ideas in the comment forum below–thanks! As this is a blog about business and networking, you may be wondering why some of my recent blogs have seemed to have a fairly apparent focus on health. I think the video I’m sharing with you today should answer that question for those of you who may wondering. Over the past couple of years, I have indeed become quite an advocate of the importance of health in regard to achieving success and there is good reason behind that. In this short video, I talk with my good friend Lise Janelle, renowned success coach for companies & entrepreneurs across the world, about the role that vitality and health play in achieving ultimate productivity and success in business. Lise offers three keys to achieving vitality and explains why it is important not only for business owners, but also for all of their employees, to focus on staying healthy and engaged in order for any given business to truly thrive. After watching the video, if you’d like to find out more about Lise Janelle and how she helps businesses and people alike to achieve their full potential, please visit www.HeartAtWorkInstitute.com. 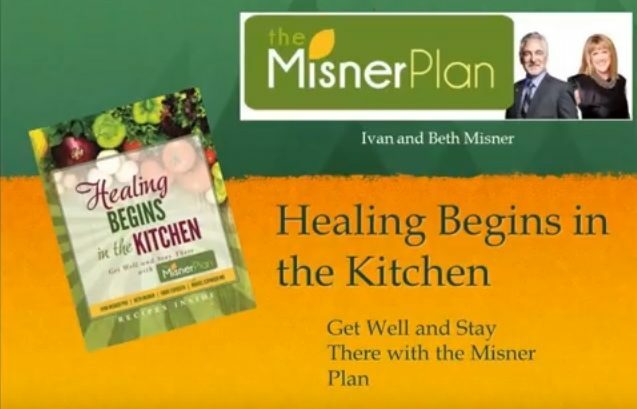 To find out more about the book I mention in the video, The Misner Plan: How We Healed Cancer Naturally with Food, Nutrition, and Healthy Living , please click here. If you’d like to learn more about the Misner Plan, please visit www.MisnerPlan.com. Do you have certain habits and/or tactics you employ to stay healthy? Do you have specific ways of making sure you stay connected to your core values? I’m really interested in hearing your thoughts on this and, also, if you have questions pertaining to this topic, I highly encourage you to ask them! I am more than happy to do a future blog addressing your questions and to consult with Lise about them in order to get you the best answers possible. Me, Write a Book on Health? You’re Crazy! I can also say that I never thought I would say that a cancer diagnosis would provide a gratifying opening for me to give back in a way that is extremely fulfilling, but it did. And because of the size of my network and the relationships I have formed over the past several decades, there are many people who want to know how I approached healing naturally from cancer. This book tells the story of my journey to remission from prostate cancer. I want to be completely clear that I am not a medical doctor, I am not selling health-care products, I am not advising anyone else how to approach their own health conditions, nor am I giving you medical advice. Beth and I are sharing what we did and the things we learned along the way in hopes that it might help other people in some way. The visible changes in BNI’s Founder Ivan Misner’s health, his weight loss and improved fitness level have led to request after request to share his eating protocol and fitness regimen after his cancer diagnosis—so many requests that we felt we needed to create the Misner Plan in order to share this information with many more people than he is able to email on a daily basis. We all know and love far too many people who are obese and/or suffering from many health issues which are due primarily to how and what they are eating. Many people know they need to make changes, but they are not interested in doing so. Many people want to make changes, but they don’t know exactly what to do. There is a lot of conflicting advice out there and there may not be a lot of support for the changes they do want to make. We need support and community in which to make lasting changes. And having the input of someone who has been there before and has regained health is very powerful. The Misner Plan offers both information and support for you as you seek to transform your life and improve your productivity, while increasing your outlook for a long and healthy life. We have learned many things on this journey, and we want to share what we have learned with you. We are still learning new things, continually finding ourselves amazed at all the things there are to know and understand about medical nutrition. 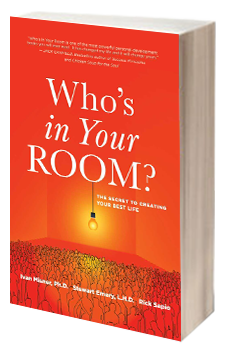 In this book, you will find stories of our personal experiences, struggles and successes. 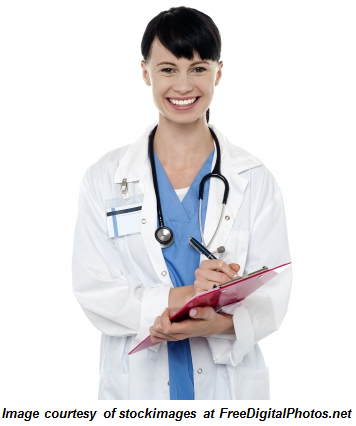 We also share input we have received from other well-informed and renowned health-care professionals. As you read through the content, we encourage you to underline and highlight the sections which illuminate your own path. Your success means so much to us and we are thrilled you have found the Misner Plan. Focusing on eating REAL, healthy, nutritious foods can save your life and can make a good life a fantastic life. 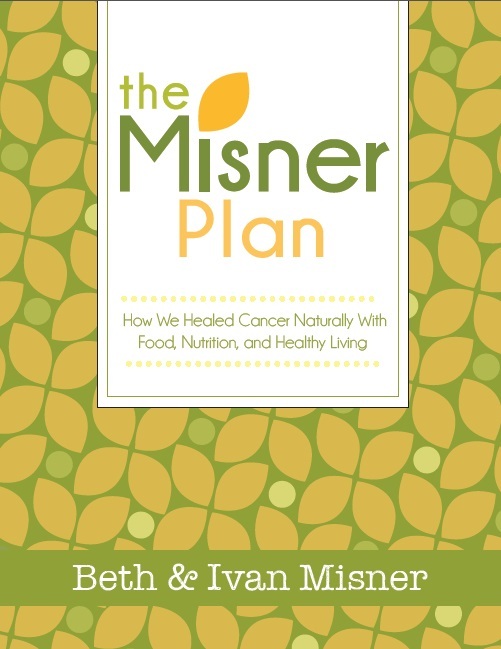 If you are interested in reading more about my experience, please take a look at The Misner Plan: How We Healed Cancer Naturally With Food, Nutrition and Healthy Living. If you read it, please leave a review and your comments to help others decide if they want to learn more by reading it, too. We also have a Facebook Page: www.Facebook.com/MisnerPlan and a website: www.MisnerPlan.com. If you’d like to follow us. If you, or someone you know, has had a great experience in their health based on a change of diet, please leave a comment here on this blog. Last month I posted a blog about changes companies can make to boost employee health & productivity and I got an e-mail message in response to it asking if I had any thoughts on how to tell whether or not an office maintained a mostly healthy environment or a mostly non-healthy environment. 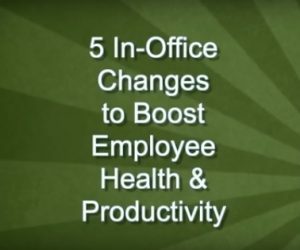 There are always going to be some people in an office who are motivated to be healthy and others who are tied to an unhealthy lifestyle, but there are certainly ways to tell when your office could benefit from positive changes. Negativity in the workplace. People who do not feel well overall tend to have a more negative outlook on life . 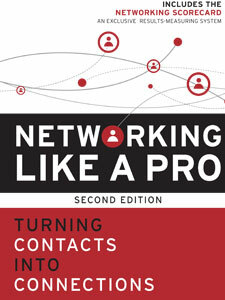 . . both personally and professionally. When suffering all day with a headache or fatiue, it is hard to feel or act positive and cheerful. If you notice that the overall energy level of your office is low or negative, then perhaps it is time to brighten things up by focusing on recapturing high levels of health in your office. If one person gets a cold or flu, many others get it. When everyone’s immune system is strong, colds and flus do not get passed around quite so easily. Some offices bring in a healthcare worker to administer flu shots each year, although the efficacy of these shots has not been proven by medical studies. In my own office, the focus on building health takes an approach of building up the staff’s own immune systems to prevent the spread of colds and flus. If you find that your office goes through times where quite a few employees are out sick at the same time, you may want to evaluate whether a health make over is needed. Many of your staff members are overweight. When the metabolism slows down and people gain a significant amount of weight, other systems in the body are also compromised. The immune system and the liver (which plays a large role in the strength of the immune system) usually do not function as well in people with slower metabolisms. When I focused on boosting my immune system and engaging my liver in the healing process, I easily lost nearly 40 pounds, all while eating four to five times per day. The difference eating fresh fruits, vegetables, and antibiotic-free and hormone-free chicken and seafood was simply amazing. While my immune system became stronger, I naturally and easily dropped the extra weight I’d been carrying for years. 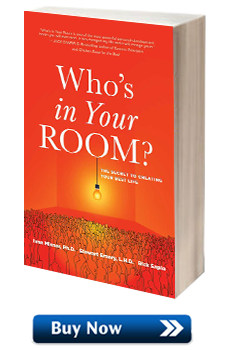 Take an objective look at your staff. If you realize that more than 10% of your employees are overweight or obese (with a Body Mass Indicator ((BMI)) of 30-39.9), then your office may benefit greatly from a health make over. Remember though, you can’t change things over night. I found that the key to encouraging some members of my office staff into adopting a healthy paradigm at work is to make incremental changes, rather than coming in all at once and making sweeping changes. Not everyone in the office will be excited about embracing a healthy lifestyle, but many will. Most people need to make changes and know it, but they may not know how to make those changes, or they may lack the motivation or willpower to do it. Having a healthy, supportive focus at work among others with whom to share this positive shift can make all the difference. Have you made changes in your office toward maintaining a healthy environment? If so, I’m really interested in hearing what you’ve done. Please share your thoughts in the comment forum below. Thanks! If someone had told me two years ago when I was diagnosed with prostate cancer that today I would be reveling in the news of a clean bill of health, I wouldn’t have believed them. However, I recently received a report from my radiologist stating that there is “gross remission of the prostate cancer . . . with no gross evidence of malignancy remaining.” In other words, a clean bill of health is exactly what I now have and I owe it largely to the radical changes I made in my diet and eating habits. In working to transform my own health habits over the last couple of years, I became increasingly aware of how much more energy I have and how much more productive I have become as a result of improving my diet and committing to consistent exercise. I now feel like I’m thriving on a daily basis instead of simply functioning; it’s a feeling that everyone deserves to have and it’s a healthy state of being which will naturally boost productivity levels in anyone who achieves it. For these reasons, I reached out to my employees and offered them the opportunity to participate in the same detox/cleanse program and diet transformation plan (the Misner Plan) that has enabled me to maximize my own health. Nine employees took me up on the offer, successfully completed the detox/cleanse, are continuing to focus on making healthy food choices, and have reported that they have noticed a significant improvement in their energy and productivity levels. Install a water filtration system with hot and cold water. Having access to pure water, not plastic water bottles or tap water, will encourage your staff to hydrate well. Hydrated brains are productive brains. Drinking soda, coffee, and black teas dehydrate our bodies. In our office, we provide coffee makers and staff members sometimes bring sodas and teas from home yet we provide herbal teas and fresh, purified water to encourage these healthier choices by making them free and readily available. Engage the entire office in a doctor-approved, body detox program. One of the first things I did after receiving my cancer diagnosis was to complete the 8-Day Detox developed by Dr. Bill Kellas at the Center for Advanced Medicine. Doing a body detox is a great way to help the body eliminate the toxins that often contribute to weakened immune systems and frequent colds & flu viruses–illnesses which account for a lot of sick time being used by staff. When nine of our office’s staff members participated in the 8-Day Detox, they were motivated and encouraged by the support and accountability they received from one another to complete the program and each of them have since remarked about being very glad they participated as they are now motivated to continue making more healthful food choices and continuing to experience more of the benefits of better health day by day. Provide healthy alternatives at staff luncheons and celebrations. Most offices provide lunch for their staff from time to time. This gives a good chance to evaluate the food you’re making available to employees. If your lunches are centered on burgers, fries, and milkshakes, consider adding some healthy alternatives such as turkey burgers, whole wheat buns, fresh juices, and salads. Not everyone will opt for the healthier options, but there are many who will appreciate having the choice. At birthday celebrations, include a fruit platter with the cake and ice cream. Start a walking club at work. You may be surprised at how many of your employees would come to the office early in order to walk together. Walking isn’t a vigorous activity which will make people wish for a second shower before starting the day at the office and it can be an invigorating way for people to get a jump start on their day. Our office offers employees a free, on-site, weekly Qi Gong/Tai Chi class during the lunch hour which is a mid-day opportunity for staff to relax, refocus, and refresh. Keep morale high in the workplace. Having a strong sense of positive morale has always been something we’ve aimed for in our office and after my cancer diagnosis, we began to put an even bigger focus on this. Mental health has such a profound impact on health that we decided to start a “Daymaker Initiative” based on David Wagner’s book, Life as a Daymaker. The focus on making someone else’s day better really captured the interest of our staff–there was a noticeable increase in office morale and in kind words and actions being exchanged among employees after they each read David’s book. Simply creating a positive environment can make your office a healthier place to be. Do you currently incorporate tactics/offer opportunities which encourage healthy lifestyles within your office? If so, I’d love to hear your ideas and what feedback/results you’ve experienced in employee health & productivity as a result of making such efforts. Please share your thoughts in the comment forum below. Thanks! Since my announcement that I am in remission, I have been receiving many requests to share the details of what I did to get healthy—so many that my wife and I have created the Misner Plan in order to share this information with many more people than I can individually. We all know and love far too many people who are obese and/or suffering from many health issues which are due primarily to how and what they are eating. Many people know they need to make changes, but they are not interested in doing so. Others want to make changes, but they don’t know exactly what to do. There is a lot of conflicting advice out there and there may not be a lot of support for the changes they do want to make. We are not selling anything. All the information on the site is free (donations to the Misner Charitable Foundation are welcome – but not required). The Misner Plan offers both information and support for you as you seek to transform your life and improve your productivity, not to mention increase your outlook for a long and healthy life. At the Misner Plan website, you will find blog posts with our personal experiences, struggles and successes, as well as upcoming contributions from other well-informed and renowned health-care professionals. You will find recipes using the specific food list I have been using during my recovery. As you read through the content, please share anything you feel would be of benefit with your own social media followers and join in the conversation on the blog page. A big thank you to my wife, Beth Misner. It was her vision and hard work that led to the Misner Plan. Do you know anyone who’s health has changed because of their change in diet? If so, share it here.